An article by Montrose teacher Deborah Farmer Kris on NPR's Mindshift blog goes viral. The recent article by Mrs. Kris focused on how to help teenage girls reframe anxiety and strengthen resilience. The post has been read and shared by more than half a million people. Mrs. Kris teaches Montrose's signature Habits of Mind class. As the Associate Director of the LifeCompass Institute, she blogs regularly on Montrose’s LifeCompass blog. In addition, she is a consultant and columnist for PBS Parents for matters related to parenting and character development. 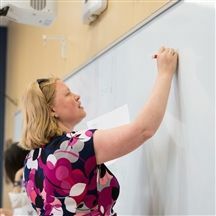 Montrose students benefit daily from efforts by Mrs. Kris and other faculty members, as they encourage the girls to reframe their approach to stress and develop strategies to rein in anxiety.